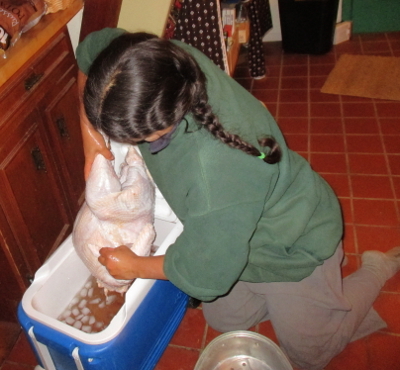 "You'll probably want to brine your turkey," my pastured-poultry producer said when we picked up our 22-pound beast. I've brined lots of chickens, but my mind drew a blank when I tried to imagine how to keep a tremendous turkey cool while submersing it in a bath of salt water. But the answer is simple --- brine in a cooler. Step one --- scrub that cooler to within an inch of its life. After cleaning ours thoroughly, I also soaked the cooler in bleach water for a couple of hours just in case, then let it dry overnight to fully kill any bad critters. At the same time, I filled some tupperware containers with water and tossed them in the freezer to create homemade ice packs. 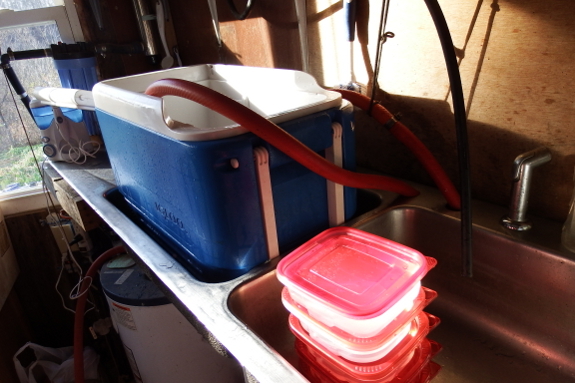 Next, I mixed salt and water and poured the combination into the cooler along with lots of ice. And the turkey of course! Put on the lid and your bird will tenderize in cool safety for eight to sixteen hours. Next step, remove the turkey from the brine and let it air dry uncovered in the fridge overnight. This step is necessary if you want crisp, rather than soggy, skin. We decided the easiest way to do this was to put the turkey in the roaster....which didn't work until we turned the humongous bird sideways. Then roast and enjoy. Have a great Thanksgiving! Interesting. Maybe this is what I should have done with my first-ever homegrown chicken that I roasted for Thanksgiving. It hadn't occurred to me that a dual-purpose homestead breed might not cook the same as one of those supermarket birds. I realized only after roasting it that it had very little fat, which may explain the extremely long time it took to cook; also that it was extremely hard to cut off the bones, though not tough for chewing--it was good eating, actually. BTW, where do you buy your pastured poultry?